Another quick note from my visit to the Winogrand archive last March. Also, nice interview with Nils…his work is great! Man, 31 frames… a reminder to all of us of the value of persistence. Looking at this shot there is no question that he got and printed the right one. Still, it makes me curious to see others from the roll either before or after this shot. Do you have any more for context? 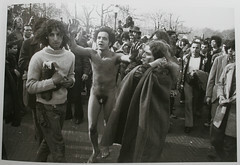 No, it’s pretty rare to come across Winogrand contact sheets. They’ve been exhibited as one-offs here and there, but no compendium has been published, sadly.